When you show a dog love, they’ll devote themselves to you for life; quite rightly earning the reputation of ‘man’s best friend’. 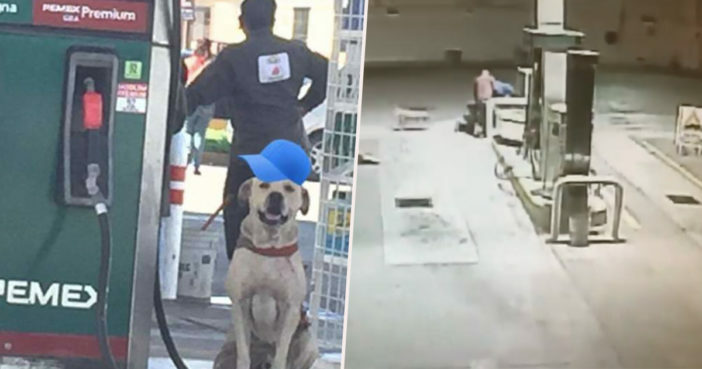 For the staff at gas station in Tamaulipas, Mexico, the loyalty of dogs became beautifully apparent, after they adopted a frightened and apparently mistreated dog. The dog had been wandering around near the gas station, looking thin and scared. We fed him, bathed him and got him vaccinated. We adopted him. Now he lives here, and is cared for by all the workers. When the time came to protect his beloved owners, Randy (his given name by his new owners), rose to the challenge, protecting them during a robbery. Two armed robbers turned up to the gas station and ordered an attendant to open up the office where the station money was kept. Randy had been snoozing in the station’s warehouse, but his slumber was disturbed by the commotion. Without hesitation, he brushed out to defend his humans, driving the criminals away. If it weren’t for Randy, who knows how things would have ended. He shows us how grateful and happy he is with us. He makes it a better experience. I always call him, and he gets in the door of my truck and brings his face to mine. It would be wonderful if the culture changed and there were more rescued puppies at other gas stations and other stores. Let’s hope this happens one day. Will other gas station owners now be inspired to find room in their hearts for a brave boy like Randy?